Dancing yellow flames, crackling logs and the earthy smell of a wood burning fireplace – what’s not to love? Fall is fast approaching and that means wood burning season! 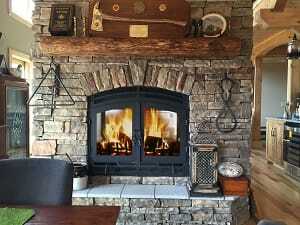 We have been designing and manufacturing the highest quality, most unique and beautiful wood fireplaces for over 35 years. Our wood fireplaces offer the largest viewing areas on the market, are built with heavy-duty 7 gauge steel, come with our Lifetime Guarantee, and provide you with not only warmth but supplemental heat; our High-Tech models can even be used for Whole Home Heating. Our most popular wood burning fireplace series is our Hearthroom 36 Series. This series of fireplaces provide up to 80,000 BTUs/Hr, can heat up to 1,800 square feet and have an average burn time of 8 hours; providing you with the perfect amount of warmth and ambiance on those crisp fall days and snowy winter nights! Our Fireplace Advisors are here to advise you and help you choose the wood burning fireplace perfect for your space! To get started and learn more about our popular Hearthroom 36 Series and all of our wood burning fireplaces request a copy of our Wood Catalog or speak with an expert today!